Steven (Chicagoland, United States) on 8 February 2018 in Landscape & Rural and Portfolio. The breakwater in Waukegan's harbor is frozen over with layers of eye-catching ice forms on this early January morning. From the archives.............taken January 3, 2010. Mama Nature has created a beautiful piece of art. From the picture it is easy to see that there was cold weather and the wind has given more ambience. Maravillosa imagen, con genial iluminación y tonos... Buena jornada. So cool! The ice looks like big drapes! Great image, Steven! Absolument splendide avec toute cette glace ! Wouhaaaaaaaaaaa!! Superbe ! Une magnifique photo ! Wow. Love it. Best not to venture out on those rocks for a while. Absolutely magnificent! The perspective of the moulded ice is beautiful!!! 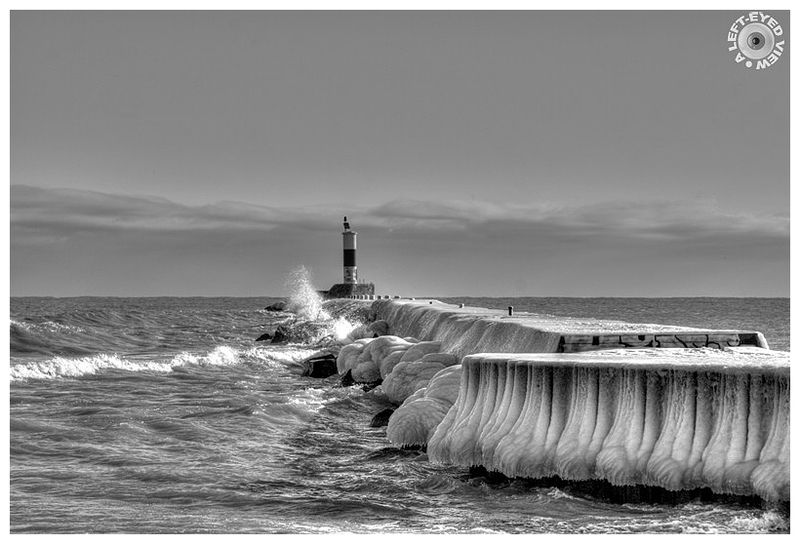 An amazing picture of the ice covered breakwater. I agree its a strong, eye-catching picture. Excellent photo work. Wow, that is spellbinding. Great image. Wow, that is a wonderful, if chilly, sight! I like the way that ice forms on the breakwater. Beautiful form on those frozen sections, and your deft use of HDR really makes it richly detailed without killing it. They look like beautiful sculptures! The detail of the ice is fabulous. A beautiful view of the lake on a very cold day! I love the black and white. That looks just brilliant. Love the icy texture and how the pier leads in through the foreground. OMG, Steven. That would have taken my breath away! C'est très beau et impressionnant. D' énormes pattes d'éléphant ! Impressionnant ! Where I live, it does not snow. And to me, these are always enchanting landscapes. You captured the frost very well.